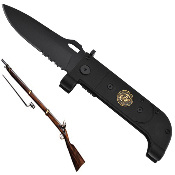 Rifle Bayonet Marines Spring Assisted Opening Pocket Knife - Featuring a razor sharp 3.75" 440 stainless steel black half serrated blade. The spring assisted opening technology allows this knife to be opened in a flash. The all metal grooved handle features a black and gold emblem and utilizes high quality torx screw construction.